Prepare delicious dishes with this GE Cafe Series CT9070SHSS French door wall oven, which features True European Convection cooking for even baking and flavourful results. Wi-Fi Connect lets you control the oven from your smartphone. GE wall ovens offer a true built-in appearance because the ovens are installed into surrounding cabinetry, which provides a custom look. This range features GE's TrueTemp system, which manages oven temperatures to ensure accurate, consistent heating and total cooking performance. The SmartLogic electronic control, with platinum sensor, constantly monitors the oven's performance to ensure more precise temperature management. The Hidden Bake oven interior hides the previously exposed bottom element to deliver a clean interior appearance. The exclusive Precise Air convection system uses an innovative fan that rotates one way then reverses direction, to allow heated air to circulate evenly around food. Plus, a third heating element surrounds the fan and delivers consistent heat for true European convection. Add more style to your kitchen with the PT7550EHES and its unique GE SLATE finish. The new SLATE finish resists finger prints while enhancing any kitchen's decor. This stylish wall oven boasts both ten-pass bake and broil elements which means whether you're browning your holiday feast or broiling some cream brulee, you will achieve even cooking results every time. The PT7050EHES comes equippied with a Self Clean Extension Rack which makes removing even the heaviest bakeware a breeze while the oven's Steam and Self Clean features make maintaining the interior even easier. This 30-inch double wall oven with Even-Heat true convection provides consistent heating and even cooking. A unique bow tie-shaped design and convection fan helps ensure there are no burnt edges or undercooked centres. The temperature probe delivers accurate measurement of internal temperatures of meats, poultry, and casseroles without opening the oven. Bold design details are the perfect balance of elegance and functionality. This 30" Combination Wall Oven with Even-Heat True Convection provides consistent heating and even cooking. A unique bow-tie shaped design and convection fan helps ensure there are no burnt edges or undercooked centres. Its upper Microwave Convection Cooking Oven combines a 900 watt microwave with a 1600 watt convection element for high speed cooking. Bold design details are the perfect balance of elegance and functionality. 30-inch Single Electric Wall Oven Self-Cleaning with Convection in Stainless Steel Prepare delicious dishes with this GE Cafe Series CT9070SHSS French door wall oven, which features True European Convection cooking for even baking and flavourful results. 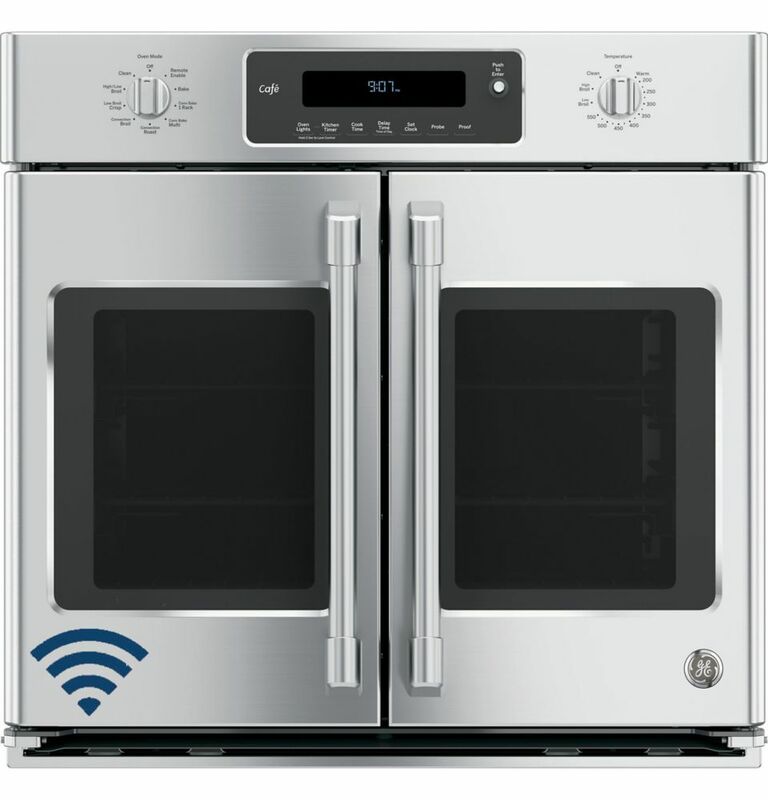 Wi-Fi Connect lets you control the oven from your smartphone. 30-inch Single Electric Wall Oven Self-Cleaning with Convection in Stainless Steel is rated 4.9 out of 5 by 129. Rated 5 out of 5 by Dave from Delivered on time, easy to install, looks great and cooks... Delivered on time, easy to install, looks great and cooks food perfectly. Rated 5 out of 5 by Grand Doc from Went in wall like a dream,great look. Easy to operate, great second oven when large meals are served. Rated 5 out of 5 by Dee from Outstanding. I love it. I like the dial feature best of all. I have had it about one week. Absol... Outstanding. I love it. I like the dial feature best of all. I have had it about one week. Absolutely love the double doors, because I am short and had trouble leaning over a door that opened outward. The double door open to the sides. I have one relative and one friend who are now on the market for the same oven. It's great. Rated 5 out of 5 by HappyCamper1059 from In love with my oven! So far, so good with this oven. It's super quiet, which I absolutely love. It heats up quickly and cooks evenly. If I had to find any fault at all, it's that it takes a long time to cool down, so we prop the doors open slightly to speed things up, and there doesn't seem to be a way to turn the light off while the door is open. Rated 4 out of 5 by Fidel43 from Nice. Easy to use Easy and simple features to use when cooking. Like the bright oven light. Double doors are easy to open and close. So far so good. Rated 5 out of 5 by chadwick57 from Perfect oven, we love it!!! We love all the features and the performance. I did not realize how good an oven could be. Rated 5 out of 5 by Kim31 from Best wall Oven! Definitely worth placing at eye level in your kitchen! Rated 5 out of 5 by Fap27 from Showstopper I have never been so in love with an appliance! It's a kitchen showstopper.